Brooklyn-trained fencer Romain Cannone continues to rise in the world ranks. During the Basel Junior World Cup in Switzerland last month, the 17-year-old, who trains at Coney Island’s New York Fencing Academy, defeated both the first and second world ranked fencers and took home the tournament’s bronze medal. As a result, the France native is ranked number one in the men’s epee under-20 category. “I was a little too relaxed at first, but after that bout, the pressure kicked in,” said Cannone, who got off to a rocky start during the day’s semifinal match against Israel’s Yuval-Shalon Freilich, ranked number one in the world. Cannone started slow, losing 0-3. Cannone’s strategy paid off as he defeated Freilich 15-14. Although Cannone eventually fell to Yan Sych of the Ukraine, 15-12, he earned bronze medal honors. “When I get in the mode, I just play around. That’s when you can see what to do, you figure it out as you go,” he said regarding his strategy. Next for the rising star, Cannone — who is currently on the junior national team — will compete at the final World Cup of the season in Latvia, and hopes qualify to compete in the World Championships in Uzbekistan. He also expects to participate in NCAA college fencing this fall. ENROLL NOW IN NYFA’S NEW SUMMER SLEEP-AWAY EPEE CAMP AT PERK! Summer Sleep-away Epee Fencing Camp! We highly recommend that you register now to reserve your spot and maximize your savings — see our links below for available discounts. Coaches will include NYFA’s Misha Mokretsov and Slava Zingerman, Medeo’s Yakov Danilenko, and Vivo’s Arpad Horvath. More will be announced. Fencers from these and any clubs are welcome to join us for what will certainly be a great new epee camp with top quality fencing and training, as well as opportunities for new friendships and fun! As we continue coverage of our month long Fit Kids Initiative, we visit New York Fencing Academy where NY1’s Erin Clarke tells us kids are building their physical—and mental muscles. Just about every kid loves a good sword fight—whether pretend or for sport. It turns out, the activity builds strong muscles too. Take it from these kids at the New York Fencing Academy in Brooklyn. “I’ve seen myself with a bit more stamina. I could do a lot more. I could push more in myself,” says Alan Temiryaev, 14. That’s not the reason they started with the sport, but it’s even more of a reason to continue. 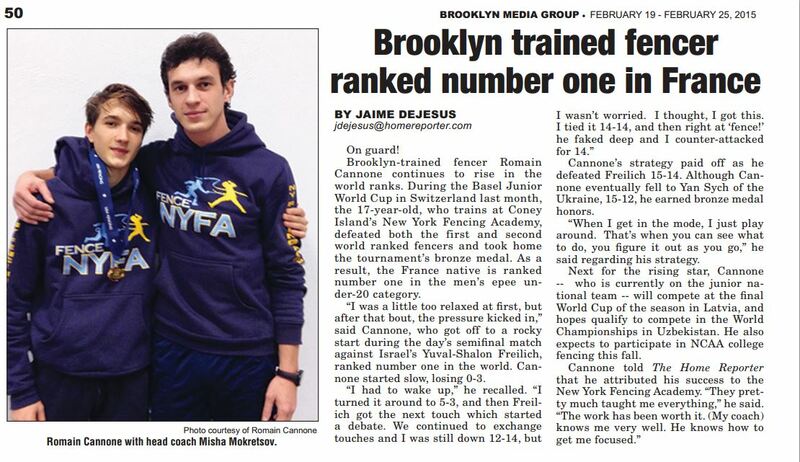 The siblings and most students here work with NYFA’s owner and head coach, Misha Mokretsov—who says parents send kids as young as four to his Coney Island club to reap the benefits of this sport. “Fencing is a higly demanding coordination sport and especially for little children, it’s very important to do sports that will be developing their agility, as well as, coordination. So fencing we have a lot of moves that are small or are changing direction, so it develops a lot of coordination,” Mokretsov says. In addition to making kids faster, stronger, more flexible and coordinated, coaches also say fencing works the thinking muscles. “It’s also very a mental sport, so you’re getting developed in terms of critical thinking, strategy,” says instructor Slava Zingerman. That’s something that helps fencers when they’re off the matts and in the classroom. Building technicall skills and physical fitness is something that will benefit these kids for years to come. For more information about the New York Fencing Academy visit fenceNYFA.com or give them a call at 718-996-0426.